Jagannath (or Jagannatha)(odia:ଜଗନ୍ନାଥ) meaning ""Lord of the Universe"", is a deity worshipped by Hindus and Buddhists mainly in the Indian states of Odisha, Chhattisgarh, West Bengal, Jharkhand, Bihar, Assam, Manipur and Tripura and by Hindus in Bangladesh. Jagannath is considered a form of Vishnu or his avatar Krishna by the Hindus. Jagannath is worshipped as part of a triad on the ""Ratnavedi"" (jewelled platform) along with his brother Balabhadra and sister Subhadra.The icon of Jagannath is a carved and decorated wooden stump with large round eyes and with stumps as hands, with the conspicuous absence of legs. The worship procedures, practices, sacraments and rituals of Jagannath do not conform with those of classical Hinduism. It is made of wood, which is an exception to common Hindu iconographic deities of metal or stone. 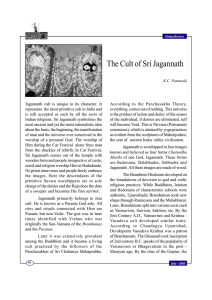 The origin and evolution of Jagannath worship, as well as iconography, is unclear and has been subject to intense academic debate.Jagannath lacks a clear vedic reference and is also not a member of the traditional Dashavatara concept or the classical Hindu pantheon, though in certain Oriya literary creations, Jagannath has been treated as the Ninth avatar, by substituting Buddha.Jagannath considered as a form of the Hindu God Vishnu, is non-sectarian and has not been associated with any particular denomination of Hinduism in entirety, though there are several common aspects with Vaishnavism, Saivism, Shaktism, Smartism, as well as with Buddhism and Jainism.The oldest and most famous Jagannath deity is established in Puri. The temple of Jagannath in Puri is regarded as one of the Char Dham (sacred Hindu pilgrimage places) in India.The most famous festival related to Jagannath is the Ratha yatra, where Jagannath, along with the other two associated deities, comes out of the Garbhagriha of the chief temple (Bada Deula). They are transported to the Gundicha Temple (located at a distance of nearly 3 kilometres (1.9 mi)), in three massive wooden chariots drawn by devotees. Coinciding with the Rath Yatra festival at Puri, similar processions are organized at Jagannath temples throughout the world.